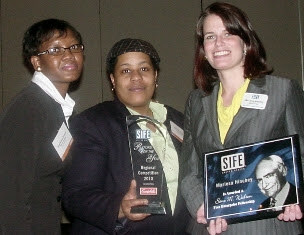 On March 22, 2010, SIFE (Students In Free Enterprise) held its Regional Competition at the Pennsylvania Convention Center in Philadelphia. Peirce College’s SIFE Chapter was one of 35 teams to compete at the all-day event which had over 300 people in attendance. I am proud to share with all of you that the Peirce team won a trophy for “Rookie of the Year” in our league. On top of that, Peirce Program Advisor Mariesa Hinchey was presented with the Sam Walton Fellowship for her role as an advisor to the chapter during an awards ceremony that concluded the event. Part of an annual series of regional, national, and international competitions, the event served as a forum for teams to present the results of their projects, which are judged based on their ability to improve the quality of life for people in need. Four of our chapter’s 10 members presented the three projects that the Peirce team has been working on. The first project is focused on helping high school students at the Science Leadership Academy with social entrepreneurial skills. The second is in regard to building basic financial literacy skills with Peirce students, and the third concentrates on the evaluation and improvement of the environmental impact of Peirce College and its students, faculty, and staff. Please join me in congratulating the team for a job well done! Congratulations to the entire Peirce SIFE team for all of their hard work, and to Mariesa for her guidance. The group’s awards will be displayed in the Walker Center for Academic Excellence and Peirce President James J. Mergiotti will celebrate their efforts at a special luncheon to be held on Tuesday, April 20. The recognition is well deserved!